The downtick in Maine donors doesn’t, on its own, say much about Collins’ relative electoral strength or weakness heading into what’s likely to be her most competitive re-election. But it does signal that outside money will continue to flood the state as Maine occupies a spotlight in 2020. 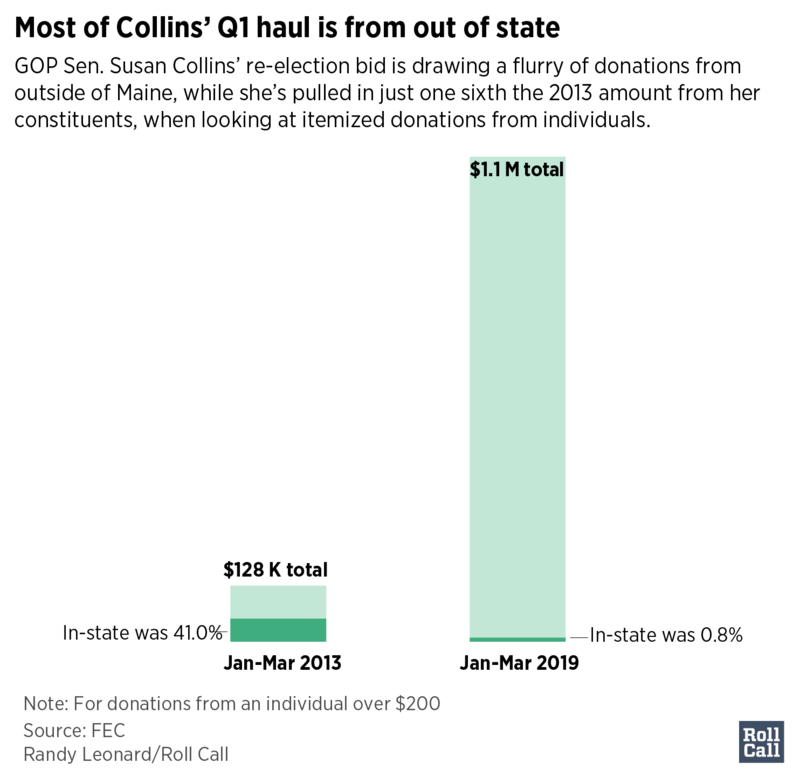 Collins raised about $15,000 in unitemized contributions during the first three months of 2019, but campaigns are not required to disclose the identity of those donors to the Federal Election Commission. It’s likely that more Mainers are part of that pool of donors giving $200 or less. Democrats, who don’t yet have a candidate in this race, will likely attack the four-term senator for being propped up by outside money. But their eventual nominee will be the beneficiary of a nearly $3.8 million and growing Crowdpac fund set up after Collins voted for Supreme Court Justice Brett Kavanaugh last year. Republicans are likely to point to the Crowdpac fund to argue that any Democratic challenger would be backed by liberal, out-of-state money. Having most of the funding come from out of state isn’t unusual — that accounted for nearly 70 percent of Collins’ itemized contributions in her last two re-elections, according to a review of FEC data from OpenSecrets.org. Collins won her 2014 re-election by 37 points and by 23 points in 2008. She remains well-liked back home, according to recent polling. Inside Elections with Nathan L. Gonzales rates her re-election Tilts Republican. But this race is already attracting much more attention — and money. Collins posted the biggest fundraising quarter of her career in the last three months of 2018, after voting for Kavanaugh. She’s raised $4.4 million for her 2020 race, compared to the $1.5 million she’d raised by this time six years ago. She’s spending more, too. Collins had already spent $343,000 by the end of March this year, compared to just $64,000 at the same time six years ago. Collins heads into the rest of 2019 with just over $3.8 million in the bank — slightly more than the balance in the Crowdpac fund set up for her eventual challenger. Clarification, April 9, 2019, 11:45 a.m. | This story has been updated to reflect that the itemized donations of two Maine residents only exceeded $200 in the latest quarter in the aggregate.